George Gilmore has been a long-time and respected fixture on the downtown NYC alt-roots music scene, starting with his first band, late-80s local heroes The Tall Lonesome Pines, and continuing through his more recent combo, George Gilmore & The Giblets. With his latest album "I Am A Weed", he steps into the league of serious scribe/tunesmiths. Musically, his palette includes traditional country, more modern alt-country, and even some glancing asides to British Invasion. For more than 20 years, Gilmore has also worked in film and theatre. He conceived and wrote the screenplay and songs for the award-winning indie film "Burnzy's Last Call", and composed and co-produced (with Crispin Cioe) music for the award-winning documentary “Five Wives, Three Secretaries and Me”. His songs have appeared in the film “Diminished Capacity” (starring Matthew Broderick and Alan Alda) and the TV Series “The Good Guys”. George joined forces with Adam Roth (Music Director for “Rescue Me”) and the Jaded Six providing musical accompaniment for Denis Leary for many years, including Denis's smash show “No Cure for Cancer”, playing various venues including Carnegie Hall. George was featured in the Off-Broadway show “True Love” at the Zipper Theatre (guitar, vocals, co-composer) under the direction of Daniel Fish, and then continued his work with Fish in “The Elliot Smith Project” at Bard Summerscape Festival (guitar, vocals) and in Fish’s “Oklahoma” at Bard College (guitar, vocals, co-Musical Director). George can regularly be found playing clubs throughout the New York area. Check the “appearances” page for upcoming gigs. "Born and bred New Yorker, George Gilmore's got some great songs on his new release 'I am a Weed.' Witty and nostalgic, sometimes dark and cruel. The song itself: 'I am a Weed', is a good introduction to George's irreverent style. With his rich and sometimes fragile voice, he sings us a slightly sinister tune about the gardener's futile struggle against nature: "You win the fight /but not the war/ when the morning comes/ they'll be many more." From there it gets darker in 'Torn Down' A beautifully sparse song – just voice and finger-picked steel guitar in a big empty room: "Harsh weather has dulled your shine the last few years haven't been so kind/ the architects have made new plans /there's a freeway going where you stand." A metaphor for the ravages of time and fast living. If there's a theme running through these cuts it's about time passing and the things we regret. But it's not without lighter moments such as recalling a missed childhood baseball catch in "Lost in The Sun." George has a nice feel for the Nick Lowe style of songwriting. Everyday themes worked into simple acoustic arrangements with the benefit of some organ and electric guitar. It's a good mix of blues, rock and folk and there's even an atheist's gospel song! I know George well enough to call him a friend and he's got some great musicians backing him up here. Charly Roth (who also produced the album) and Adam Roth on guitar help the whole thing come together. Charlie Giordano from Bruce Springsteen's 'E' Street Band and bass player Scott Kitchen do good work here too. There are a few artists out there who can be said to work an American variation on the various phases of Nick Lowe's early career—Walter Clevenger's power pop and John Paul Keith's garage Americana come to mind—but where is the US equivalent of latter-day Lowe, the cool, classy balladeer whose quietly crooned tunes are shot through with rootsy rock & roll savvy? Right here. Flashes of soul, rockabilly, folk and even gospel illuminate George Gilmore's tales of a man who's been around the block enough to narrate every square foot of it with authoritative ease. 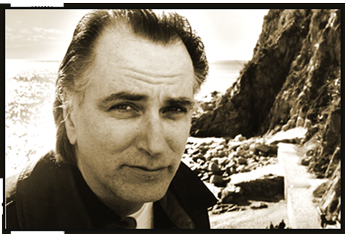 "December 11th, 2011 — North Fork Sound Album of the Week: "George Gilmore — I Am A Weed"
This New York City veteran singer/songwriter/guitar slinger has been a mainstay on the Americana/roots-rock scene for over two decades. His latest finds him in great form on these (lucky) 13 tunes exploring the journey of life with and without love, accompanied by an able stable of well-known Big Apple players. Tops for me is his gospel-fueled offering 'The Good Lord Smote My Eye'." 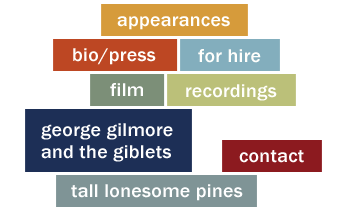 "George Gilmore has been a long-time and respected fixture on the downtown NYC alt-roots music scene, starting with his first band, late-80s local heroes The Tall Lonesome Pines, and continuing through his more recent combo, George Gilmore & The Giblets. But Gilmore has also a been a "real" writer for some time (e.g., he conceived and wrote the screenplay for the award-winning indie film "Burnzy's Last Call"), and with "I Am A Weed", he steps up a whole bunch of notches into the league of serious scribe/tunesmiths that includes Leonard Cohen, Kris Kristofferson, John Prine, and Townes Van Zandt. Musically, his palette includes traditional country, more modern alt-country, and even some glancing asides to British Invasion tropes ("The Last Resort" channels the Small Faces via a Joe Jackson-esque edge to the melody, without ever losing track of Gilmore's thoroughly American take on a classic guilt-ridden day-of-reckoning scenario). And the music fits the mood on every song here (kudos to producer Charlie Roth for the variety of musical tableaux that enhance without overpowering the subtleties inherent in Gilmore's lyrics, to Adam Roth for the ultra-sympathetic plectrum work, keyboardist Charlie Giordano for the excellent swashbuckling organ). But it's the words that ultimately drive the music here, and while Gilmore can be funny at the drop of a syllable ("The Good Lord Smote My Eye" wades into gospel-fried mock-religious enquiry with lines like "Well, He musta had a reason…"), overall, this is an album than does not avoid the down-side of life. The good news is that George Gilmore has matured as an artist to the point where he can delve into heavy themes with a sure metaphoric touch and some real poetic authority. "Bottle in the Weeds" works as both a simple drinking song and a deeper look at the whole idea of hidden objects that can dog us in life; "Lost It In The Sun" becomes a haunted memory play about lost love; "What Good Would It Do" is like an intimate, Leonard Cohen-style ballad where the singer realizes he's blown it for the last time with a lover; for all its subtlety, this song would also sound entirely credible and heartfelt on a George Jones album. But perhaps the crowning achievement here is also the most deceptively simple tune, "Torn Down". With only a delicately plucked steel guitar as accompaniment, the singer reviews a litany of life's disappointments and gradual erosions without, amazingly, wallowing in self-pity. The song is so well-written, and the analogies and metaphors are so expertly and casually tossed off like leaves sliding past in a stream ("…wear and tear and a little threadbare, remember way back when you didn't care, bit by bit you fall apart, first a little crack and then a big one starts…"), that its inherent sadness never overwhelms…not once. It's not easy or common to hear a song this basic, that deals with the big issue so clearly and intimately. With "I Am a Weed", George Gilmore finally steps up to the plate as a songwriter, and knocks it right out of the park.